Develop competitive advantage with our above template which contains a diagram of king in front of black pawns. This image clearly defines the concept of competition. Adjust the above image in your PPT presentations to visually support your content in your Business PPT slideshows teamwork, strategy and leadership. Our PPT images are so ideally designed that it reveals the very basis of our PPT template to make your clients understand. Enthral your listeners with your suggestions. 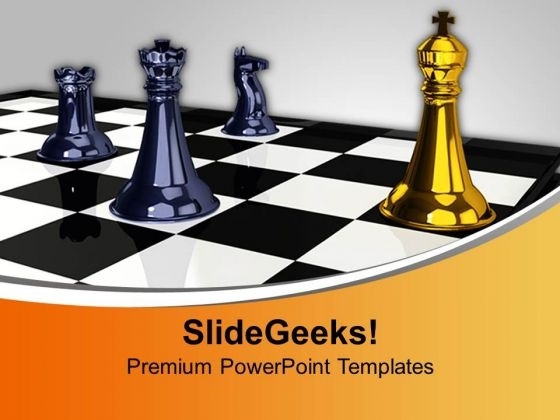 Keep them clued in with our King In Front Of Pawns Game PowerPoint Templates And PowerPoint Themes 1012. Blow their minds with our King In Front Of Pawns Game PowerPoint Templates And PowerPoint Themes 1012. Just download, type and present.